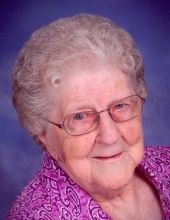 Florence S. Nosbisch, age 93, of New Hampton, IA, died Sunday, January 20, 2019, at Linn Haven Rehab and Healthcare in New Hampton. A Mass of Christian Burial will be held 10:30 a.m. on Monday, January 28, 2019, at Immaculate Conception Catholic Church in North Washington, Iowa with Rev. Brian Dellaert celebrating the Mass. Interment will be in St. Mary’s Cemetery, North Washington with Keith Huegel, Randy Nosbisch, Todd Nosbisch, Adam Nosbisch, Michael Nosbisch, John W. Nosbisch, Kevin Nosbisch, and Dan Dempsey serving as pallbearers. Honorary pallbearers are Florence's grandchildren. Friends may greet the family 3:00 - 7:00 p.m. Sunday, January 27, 2019, at Hugeback -Johnson Funeral Home and Crematory in New Hampton where there will be a 3:00 p.m. Rosary, and a 7:00 p.m. Scripture service. Further visitation will be one hour prior to the service Monday at the church. Florence Susan (Dockendorf) Nosbisch was born January 16, 1926, on the Dockendorf family farm near North Washington, Iowa, the daughter of George and Agnes (Denner) Dockendorf. She was baptized, received her 1st Communion, and confirmed into the Catholic Faith at Immaculate Conception Catholic Church in North Washington. She attended St. Mary's Grade School and High School in North Washington graduating in May, 1943. Florence worked at Derenthal General Store and the North Washington Post Office from June, 1943 till October, 1946. On October 7, 1946 at Immaculate Conception Catholic Church in North Washington she married John A. Nosbisch. Florence and John were partners in farming the Nosbisch Family Farm (where Randy and Morgan now live) near North Washington until retiring in 1981. While living on the farm they were blessed with eleven children. The couple moved into New Hampton in 1989. Florence was a member of Immaculate Conception Church and the IC Rosary Society. She was a past president of the Rosary Society and taught in the CCD program after St. Mary's School closed. She belonged to numerous cards clubs including the Country Neighbors Card Club. Florence enjoyed roller skating, cooking and baking, playing cards, and quilting. She made a quilt for each of her children and a baby quilt for her grandchildren and great-grandchildren. Most of all she enjoyed spending time with her family, and in later years seeing her great-grandchildren play and dance. Florence is survived by her children: Sr. Frances Nosbisch O.S.F. of St. Lucia; Linda (George) Huegel of Ionia, IA; Don (Deb) Nosbisch of Charles City, IA; Tim (Susan) Nosbisch of New Hampton, IA; Mike (Susie) Nosbisch of Wytheville, VA; Lynn (Janet) Nosbisch of Dyersville, IA; Wayne Nosbisch of Menlo, IA; Ken (Linda) Nosbisch of Republic, MO; Barb (Tim) Dempsey of Windsor Heights, IA; Joan Nosbisch of New Hampton, IA; 27 grandchildren and 42 great-grandchildren; one sister Agnes Gebel of New Hampton, IA; many nieces and nephews. She was preceded in death by her husband John in 2005, her daughter Mary Catherine, who was stillborn, her parents George and Agnes Dockendorf; her brothers, Raymond (Lenora) Dockendorf, Harold Dockendorf (in infancy) and brother-in-law, Bob Gebel. To send flowers or a remembrance gift to the family of Florence Susan Nosbisch, please visit our Tribute Store. "Email Address" would like to share the life celebration of Florence Susan Nosbisch. Click on the "link" to go to share a favorite memory or leave a condolence message for the family.